UG-11, Chokhani Square P-4, Sector 18 Noida - 201301, U.P. 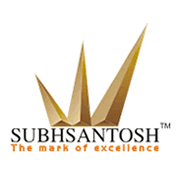 Subh Santosh Group is a well known name in the real estate market in North India. Established in 2006, they aim to build quality residential and commercial projects, provide the clients with unmatched living standards and thus bring about a better tomorrow. Their motto is “a change from within” and their mission is to create micro and mega structures for premium customers throughout India and to be the most efficient and consumer friendly real estate company in the market. Subh Santosh Group also offers a host of real estate services including market research, design consultancies, project procurement and much more. Subh Santosh Group has built many residential and commercial developments and the most noteworthy projects include Nirman Apartments, Platinum Towers and Holiday Homes Haridwar. These projects have been highly successful thanks to their innovative design and constructional brilliance as well as the luxurious conveniences and comforts that are amply provided. The best materials and cost-efficient building practices are employed by this company to ensure that all their customers are fully satisfied. With a corporate philosophy of blending aesthetics with ethics, the team of highly qualified leaders and industry professionals at Subh Santosh Group has taken on the task of transforming the quality of life of individuals as well as the society at large.